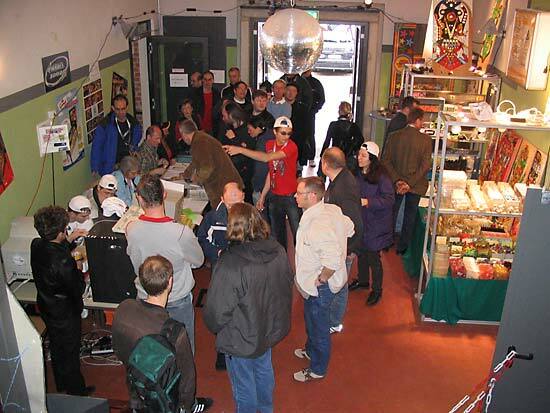 After last year's successful relaunch of the European Pinball Championship by the Dutch Pinball Association, this year it was the turn of the German Pinball Association who held the event at the Feierwerk in Munich. Finding the location was made easier by the signs from the train station and it was only a few minutes' walk away. 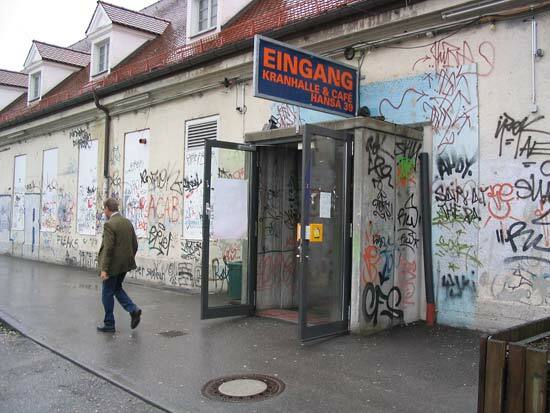 As you can see from the exterior pictures, the venue looked rather dubious with all the graffiti but it was actually quite a pleasant neighbourhood even with the persistent rain on Friday and Saturday. Enter the building and you find the registration area in the lobby. Entry to the tournament cost €25 for the weekend, which included play on the recreational games. Those not wishing to enter the tournament could pay €15 and play just the recreational games. Competition players all received their personalised ID cards. Each card included a picture of the player and a barcode for use with the Flipper Mania competition games. Pre-registration was available on the internet where players could upload their own pictures and have their cards ready for collection when they arrived. Those registering on the day had their picture taken with a webcam before their cards were printed. 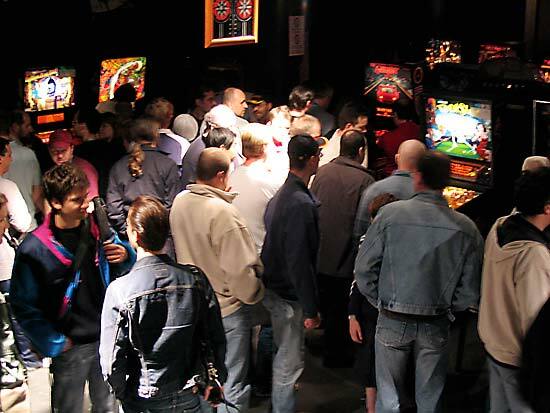 The show was divided into two areas; one for the tournaments and one for recreational play with about the same number of games in each. The tournament games were through the door at the bottom-right of the picture above. The door at the top left led to a café area with a second parts seller stand and then on to the recreational games room. The cafe area was a welcome refuge from the noise of the two games rooms. It served coffee, soda, beer, pastries, cakes and hot food at meal times. Unfortunately, it was the only area where smoking was allowed inside the building (and it was raining outside) so the atmosphere could get a bit dense at times. Prices were fair with a coffee about €2, a 500ml wheat beer at €2.90 and hot meals around €6. 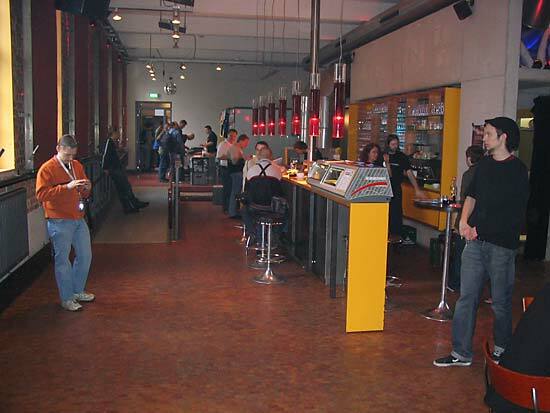 Overall, the layout worked and the café was a good meeting place between the different games areas. There was one final area upstairs where more parts were available from two sellers. Prices from all the parts vendors were quite reasonable and didn't seem to be marked up just for the show. Most common spares were available such as switches, lamps, plastic guides, side rails, bolts, fuses and slingshot plastics but there were also many interesting specialist products. 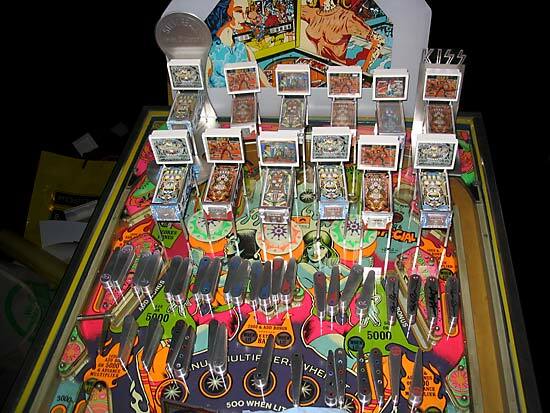 Geiger were selling playfield and backglass conversion kits for '80s Bally games to change them into themes for the German market, such as Wild Schultz and Miss World. There were also plenty of t-shirts available and the PinLED displays were there too along with LED replacement lamps in various colours. But the show was mainly about playing pinball, so here are the games available in the two rooms. 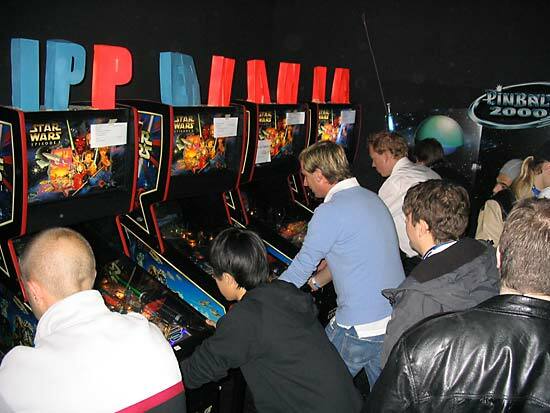 The five Star Wars Episode 1 games and four of the six Revenge From Mars games formed the Flipper Mania competition. Each tournament player had an inclusive attempt at the high score on either game using their player ID card. 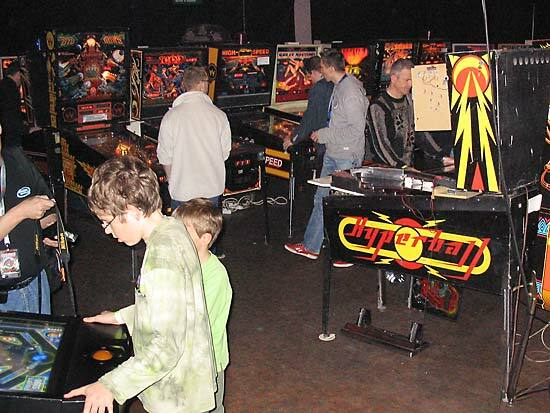 The games were fitted with network cards and connected to a central server which recorded the player name and score details and fed the highest scores to the displays of the games and other standalone monitors. A similar system was used at Pinball Expo in 1999 to keep track of their 12 Star Wars Episode 1 games. The version at the European Championship differed because it had to keep track of the scores on two different games but was otherwise very similar. 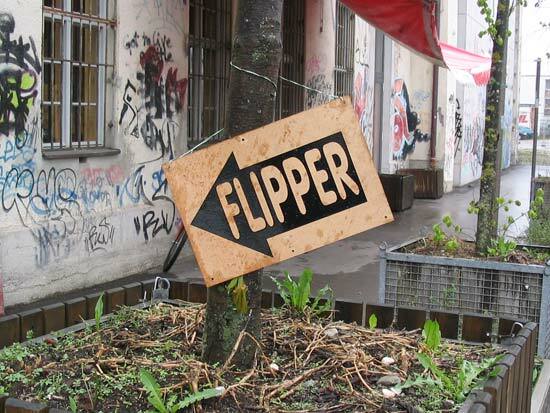 Players could purchase extra attempts at the Flipper Mania competition for €1 with the proceeds going into the prize fund which quickly climbed towards to €1000 level. The Country Competition saw teams of four players competing for the title of European Country Champions. Ten countries entered - Germany, Sweden, The Netherlands, Belgium, United Kingdom, France, Hungary, Austria, Switzerland and the U.S.A. The first round of the competition was to reduce those 10 teams to 8. The host country - Germany - and the holders - Sweden - were given a bye through the first round so the others split into 2 groups of 4 teams and played a single 4-player 4-ball game with the lowest scoring countries going out. Belgium and the UK went out here with each team member playing just one ball each. They could then take part in the individual tournament. The remaining 8 teams split into 2 groups and spent the rest of Saturday battling it out late into the night. Group A contained Sweden, Germany, U.S.A. and The Netherlands, while Group B was Switzerland, Austria, France and Hungary. The quarter finals saw the winner of Group A (Germany) play the second place in Group B (Hungary), and the winner of Group B (Switzerland) play the second place in Group A (U.S.A.). From those game, Hungary and the U.S.A. went through to the exciting final played late into the night before newcomers Hungary took the title of European Country Champions, beating the U.S.A. into second place. Hosts Germany came third followed by Switzerland after a play-off. The Hungarian victory was only made possible by the Spanish team dropping out a few days before the event which allowed the Hungarian team to compete. Congratulations to them for a well-earned win. While the Country Championship was taking place, the battle for the individual European Championship title was under way. There were 173 competitors in the first qualifying round and they were split into 4 divisions (T1 to T4) and then further divided into around 11 groups of 4 players. In a long and rather tedious process, each group's names were called out and they came to the stage to collect their score cards. The 10 score cards each showed a different game for the group to play along with the player order. Although the players were playing as a group, it was their individual scores compared to all the other scores in their division that mattered. So you could win your group game but if other lots of other players in the division scored higher, you wouldn't get many points. There was no defined order of games, so when each group had completed their game they had to find a vacant game to play next. That lead to a lot of hovering around games about to finish as different groups vied to play next. That situation wasn't helped by the cramped conditions in the most parts of room which made it difficult to find enough space to play on some games, and movement between games impossible at times. When a game was completed, players wrote down the scores on their score card and attracted an official who verified them and passed the card to the competition desk so they could be entered into the computers. There was a large projection screen on one wall which showed the progress of the qualifying. The positions were only indicative until all the games were completed because some groups took longer to complete their games than others. When all games had been played the top 13 from each division went through to Sunday's final round where they were joined by the 16 players from the top 4 country teams making 68 players in total. Here are the results from Saturday's qualifying round courtesy of SeTi Technologies who produced the scoring system for the show and input around 2,500 scores. 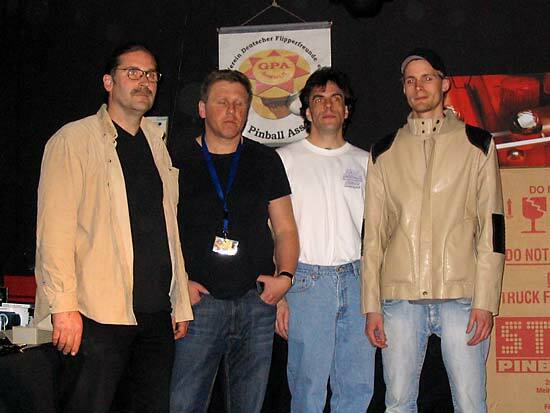 On Sunday, the same procedure was used with 17 groups of four players. 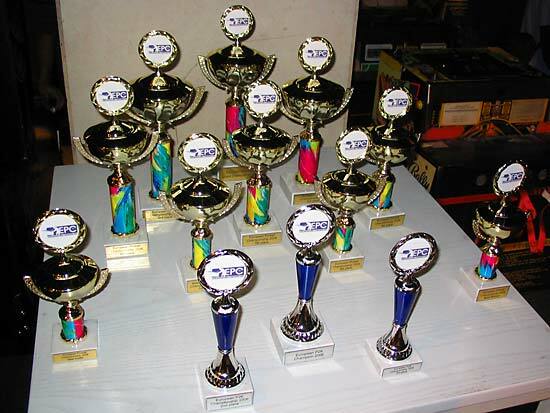 The only problem was, there were only 12 games on which to play, so there were always 5 teams with nothing to play. This situation worsened when Earthshaker! was deemed irreparable and taken out of play. The other games used for the final round were: Indianapolis 500, Monopoly, Gorgar, Monster Bash, Ripley's Believe It Or Not!, Cirqus Voltaire, High Speed 2 - The Getaway, Breakshot, Star Trek (Data East), WWF Royal Rumble, Corvette. Action began at noon and continued (with a break at 2pm) until 7pm when the last team were finished and the result was announced. 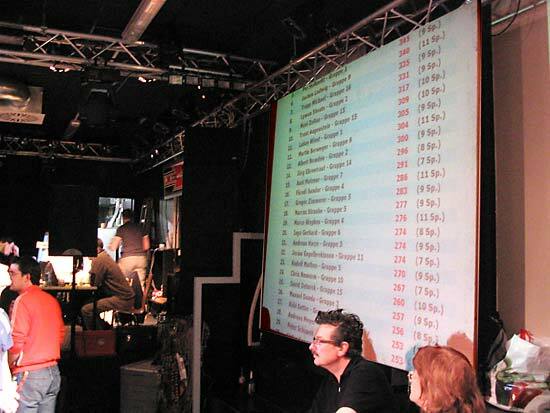 During the latter stages, the top four positions were not shown on the projection screen to build the excitement. 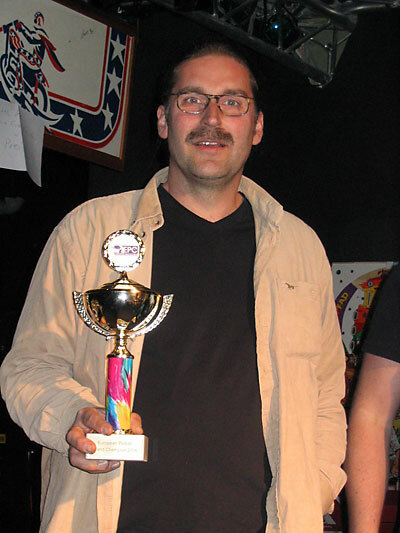 The results were read in reverse order with Lyman 4th, Jörg 3rd and Jorian 2nd, which meant the Martin had won and was the new European Pinball Champion. Here are the full results for the 68 players in Sunday's final round. There was a lunchtime break in the individual competition on Sunday, not only to get refreshments but also for an upstairs seminar with Lyman Sheats and Tom Uban. 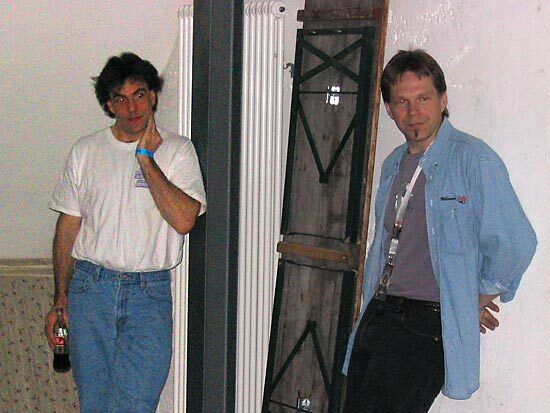 Lyman and Tom spoke to the assembled audience about their time at Williams, the development of Pinball 2000 and the state of the business today in a question and answer format. 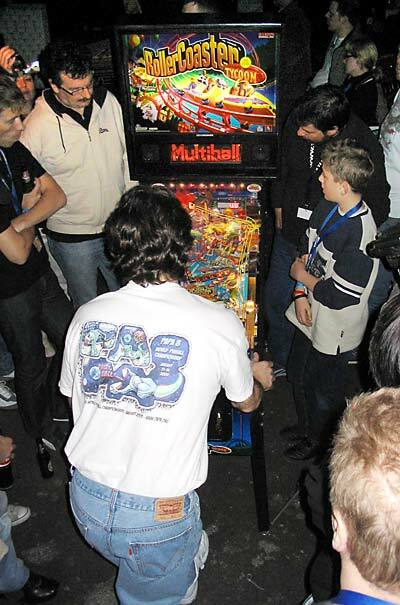 There was much talk about "what could have been" with Pinball 2000 and the real reasons Williams pulled out of pinball. After the individual competition was concluded, there was a bit more fun with a play-off between the top four players on a new-in-box Rollercoaster Tycoon. But first they had to set it up. 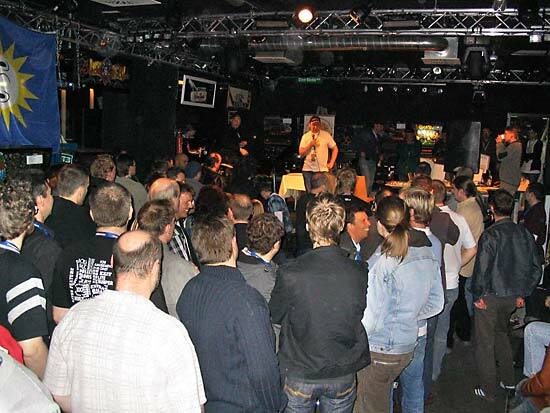 After a quick fix to resolve a problem with the game, the final game of the show took place with an assembled crowd keen to see the best four players in action against each other. Lyman took an early lead and despite the best efforts of the other players, it was one he hung onto throughout the game to take first place. 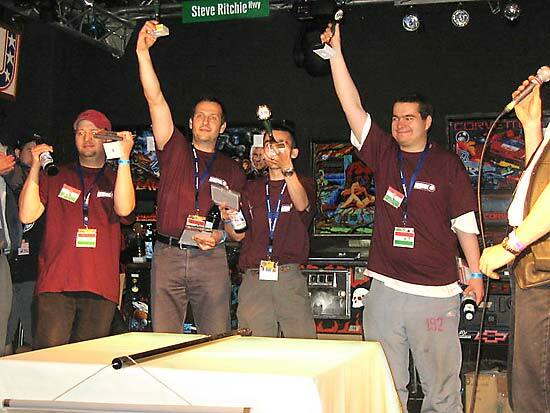 This year's event firmly established the European Pinball Championship as a sustainable annual event. Players came from all over Europe and from the U.S.A. to Munich and the main competitions winners were not the familiar faces. Game quality was high with only a few breakdowns which did little to influence the smooth running of the tournaments but that's not to say there is no room for improvement. Indeed, having no room was precisely one of the problems. The venue has a lot going for it but space is not one of them. The main stage area took up too much floor area and left too little for the games and players. The format of the individual competition was not optimised for the maximum excitement and tension. If the top four players went into a final game to decide the winner there would be a good reason for the rest of the players to hang around. Otherwise - unless you happened to be one of the three other people in their group - how many people have actually seen the winner play? It was also a bit galling to travel all the way to Munich to represent your country and to be knocked out after playing just one ball. There has to be a fairer way than that to whittle down the numbers. Getting the Pinball 2000 system working (albeit with a few bugs) was a major coup and not to be underestimated though. Congratulations to everyone involved in setting that up and also to the folk behind the main scoring systems for a clear and informative display. Overall, everyone in our group enjoyed the trip and the selection of games in the recreational room was a revelation to many. Who knew all those old '70s and '80s Bally games could be so much fun? They certainly made a nice contrast to the more familiar dot matrix games in the competition room. It was a shame that brand new World Poker Tour wouldn't power up properly - not a good advertisement for Stern. 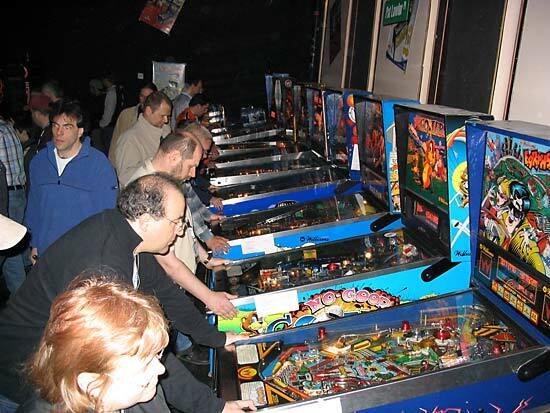 Take a video journey through the European Pinball Championship in just three minutes. So next year it's off to Sweden for the 2007 EPC. Best of luck to them and we hope to be there to report from the show.